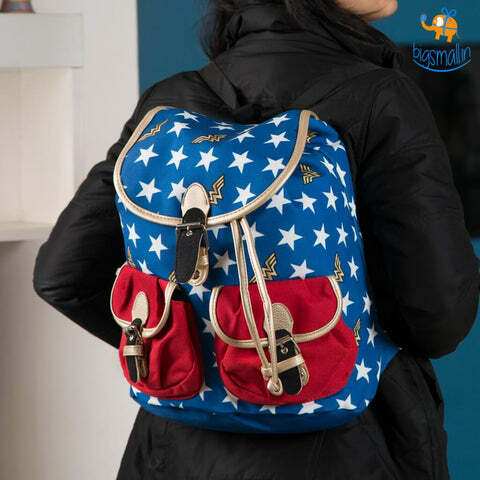 Buy attractive, fun & quirky backpacks at none other than bigsmall.in. 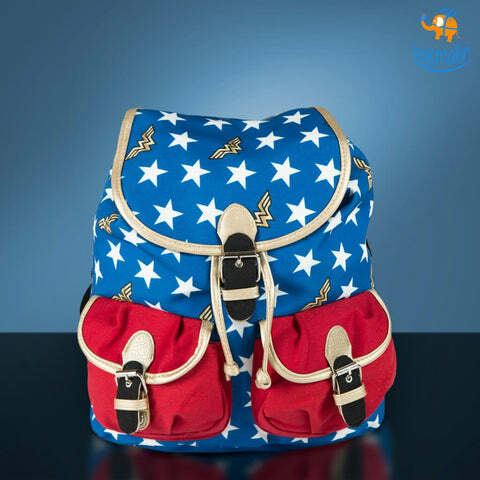 Choose from a range of superhero, comic doodle backpacks to cater to every need. A backpack—also called knapsack, rucksack, pack, sack pack, or back sack—is, in its simplest frameless form, a cloth sack carried on one's back and secured with two straps that go over the shoulders, but it can have an external frame, internal frame, and there are body packs. Backpacks are commonly used by hikers and students and are often preferred to handbags for carrying heavy loads or carrying any sort of equipment, because of the limited capacity to carry heavy weights for long periods of time in the hands. Is the baby sibling gearing up for college? Searching for funky backpacks for teenagers?! Look no further amigos, Bigsmall.in, the best in class, unique online gifting store has just the stuff you have been dreaming of. Your search for backpacks online meets its match in the form of cool pizza putter backpack, comic doodle backpack, pastel rainbow backpack & the likes of it. Are you space conscious? Can’t stand clutter, like your stuff to be neatly stacked & packed? Check out the amalgam of functionality & style in the ergonomically styled foldable backpack available in multiple attractive colors. With its 3 pockets, the foldable backpack is vast - but when you wish, the backpack can completely fold into one of its small pockets - folding so small that you can even stow it in your pocket. Make a gift of these uber cool backpacks or hoard them all for yourself! Love hoarding quirky trending backpacks?! Often catch yourself doodling awesome designs on the office notepad? We have got you sorted on your storage needs with the awesome doodle backpack. Bring back all your fun childhood memories with the Comic Doodle Backpack. This bag is ideal for regular school work, meetings or a sudden getaway. It is equipped to take you wherever you want to be. 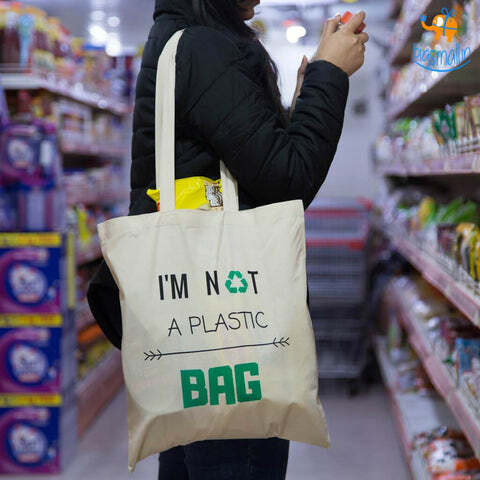 Made of water repellent polyester, it is perfect for students as well as working professionals who want the regular bag useful with a quirky look. 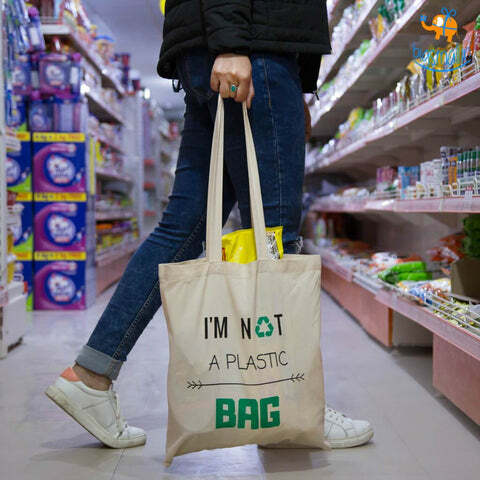 The bag is portable and perfect for an active lifestyle. Foam padding on the back and adjustable padded shoulder straps deliver maximum cushioning and support. It has secret storage big enough to hold a hard drive or even your sunglasses. The front chamber can be used to carry your essential knick knacks. It has single storage, laptop separator, and organizational pockets wherein all your stuff will be sorted. Make your travel less primitive with this Comic Doodle backpack. Know a superhero fan? Someone who lives & breathes superheroes?! Check out the cool new officially licensed superhero merchandise - backpacks, such as Batman backpack, Wonder Woman backpack & Deadpool backpack. Now you can own a bag as cool and mystic looking as Batman himself. This Batman backpack is insanely cool. All black has never looked this chic! You have a ton of pockets at your disposal to store all your belongings in. If you're a huge fan of the Dark Knight, this backpack is just what you need. It's the perfect accessory for school or college. The search for backpacks for college goers usually trends around admission time. With admission season just around the corner, we bring to you a range of attractive backpacks which are fun, quirky & super spacious at the same time! Planning a trip around the world, whether or not you make it in eighty days, is for you to figure out, but you can leave the dig for cool travel essentials to us. Check out the foldable travel backpack, which truly packs a punch & ensures that your stuff stays sorted & gathers minimum space. Foldable travel bag resolves your luggage problem in a go. Made of polyester, it transforms itself into a large airplane/ travel/overnight bag and stores all your stuff properly. It can be easily attached to the trolley which makes it easier to carry during your trips. Available in four colors (Green, orange, blue and pink), it is a combination of stylish look and desired utility. When not in use, it folds itself into a tiny size and saves you a lot of storing space. 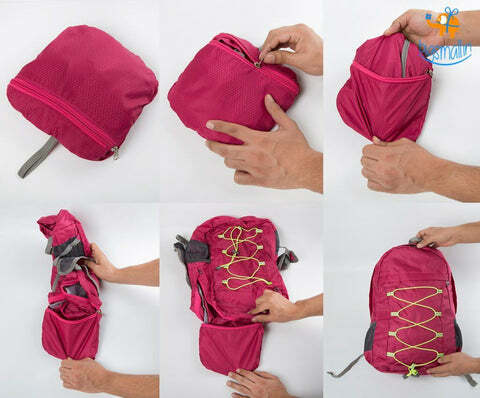 Foldable travel bag, thus, is a creative gift for travelers to give on their birthdays. Online shopping in India is assuming tremendous proportions & we at Bigsmall.in cater to all your creative gifting needs, with the best in class, officially licensed premium merchandise.